Working in high places comes with a lot of drawbacks. The most obvious drawback to working in a high place is that there is an element of danger. If something goes wrong, there is a chance for disaster. Aside from the danger, you also have the difficulties that come with getting to the area where you need to work, and actually having the means to perform the work once you are there. Depending on the job, there could be several different pieces of equipment that may be used for safety and to help move the worker into position. For commercial window cleaners and many other people that need to work at great heights, one of the most important pieces of equipment is the bosun’s chair. What is a Bosun’s Chair? The bosun’s chair is a tool of both safety and convenience. In this simplest sense, it is a piece of equipment that makes it possible for a person to work suspended from a height. A bosun’s chair will have some type of seat, and it will have a safety harness and rigging. The rigging attaches to ropes, and the ropes and pulleys are used to move the chair up and down. The most basic type of bosun’s chair would not be much more than a plank with the necessary rigging. While the simple bosun’s chair with just a plank for a seat is common, you can also find models that have different design features that are intended either for added comfort or for improved safety. Some will have additional straps for keeping the user in the chair, and others might have an actual seat with a backrest and sides. It might sound like a type of climbing harness, but it is different. A bosun’s chair and a climber’s harness will have some things in common, and they may even have some of the same components. However, the rigid seat of a bosun’s chair does make a difference in the freedom of motion that the user has. 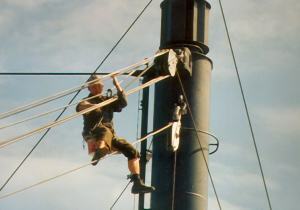 A bosun’s chair allows the individual to work comfortably while they are suspended, but the restricted motion would not allow the user to climb. With a climber’s harness, you have the freedom of motion that is necessary to climb, but the lack of a seat would make it uncomfortable to perform work from it. The first uses of the bosun’s chair come from sailing. On a ship, the bosun (or boatswain) is the officer in charge of the deck crew. In the bosun’s duty, they have to manage and maintain the rigging, and this means sending men aloft to work on the sails and up on the mast. The bosun himself would not usually get in the chair. As the officer in charge, he would assign crewmembers to go up in the bosun’s chair. In the earliest days of the bosun’s chair, it would not be much more than a plank with some ropes attached or the seat may have also been made from heavy canvas. This design made it possible for crewmembers to ascend and work in a way that was safer and more convenient. That said, in the early days there were few safety measures that could be taken to protect the user. With time and the development of technology, the bosun’s chair started to get safer and easier to use. The harnessing and rigging go more secure and this reduced the chance that a worker may fall from the chair. Another modern development is the addition of various safety clips and additional lines that are there in case of an equipment failure. The raising and lowering of the chair is another way in which the use of a bosun’s chair has change. In the old days, the user would be hoisted by other crewmembers. Now you can find many systems that use an electric winch with a control system. Even the manual winches offer better safety than the older systems because they can lock into place preventing the possibility of slippage. Even all these years later, a bosun’s chair is still an important piece of equipment for managing and maintaining the rigging on a sailing vessel. Obviously, the sailors of today will use the more modern systems, but they still have to get up there to do their work, and when they do, they go up in a bosun’s chair. Sailors are not the only people that might need to work in high places, and people eventually recognised the potential for the bosun’s chair in other industries. Away from the sea, the security, convenience and comfort of a bosun’s chair can work well in construction, maintenance and it can even be used by rescue services. Window washers and maintenance professionals might use a bosun’s chair to work on the exterior of a high-rise building. 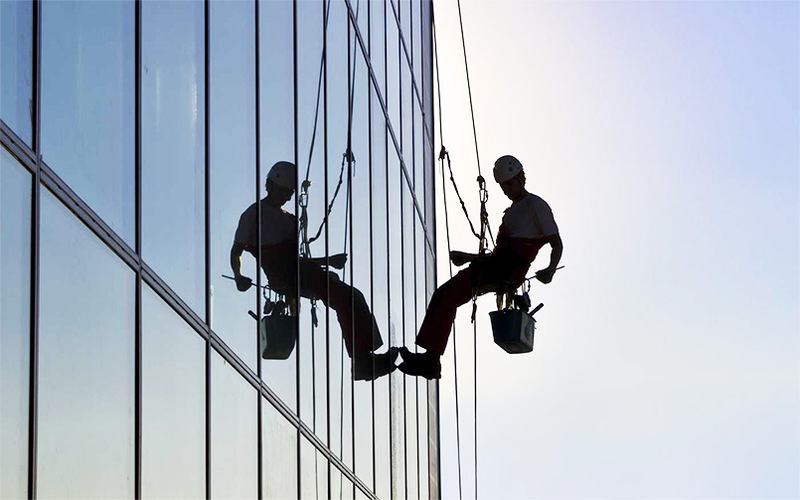 If work like washing windows needs to be performed on the exterior of the building, there might be a winch and rigging at the top of the building. The worker can then be lowered down the side of the building to where the work needs to be performed. Painters and construction professionals may also use a bosun’s chair for working under similar circumstances. The worker may need to be suspended from a skyscraper or it could be part bridge maintenance. In these situations, the bosun’s chair can provide a safe platform that can be comfortable to work from for an extended period of time. Without the bosun’s chair, there would be many jobs that would be either much more difficult or much more dangerous. Even with a good bosun’s chair, you still need to follow a range of safety protocols. There are various failsafe measures that are designed to protect the safety of the user, and you also have to concern yourself with the maintenance of the chair itself. You have to store it properly, maintain the rigging, and you always want to inspect the components before every use. What is Water Fed Pole Window Cleaning Anyway?